The Food Truck Bazaar This Weekend! 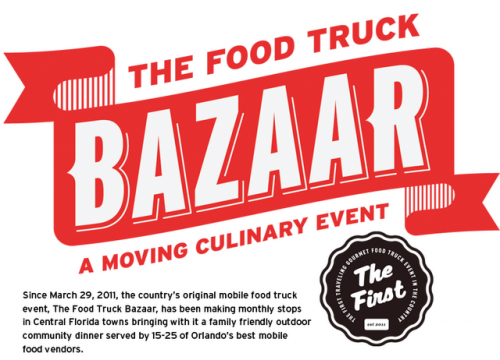 The Orlando Food Truck Bazaar is rolling into the Orange City K-Mart Plaza this Sunday. Trucks in attendance include Twisted Cuban, Cafe Rouge, Firehouse BBQ, Saigon Sizzle, The Flattery, Beard Poppa, Gastro Truck, Tastebuds, FeastBeast, C and S Brisket, Pop Craft, The Batter Bowl, and Yum Yum. The Orange City K-Mart Plaza is located at 810 Saxon Blvd. The ring masters of the bazaar suggested you bring you own chairs and be ready for long lines. With so many people in attendance, there is a chance some trucks will run out of food. The bazaar usually runs from 6-9pm during the summer season. For more information, head over to TheDailyCity.